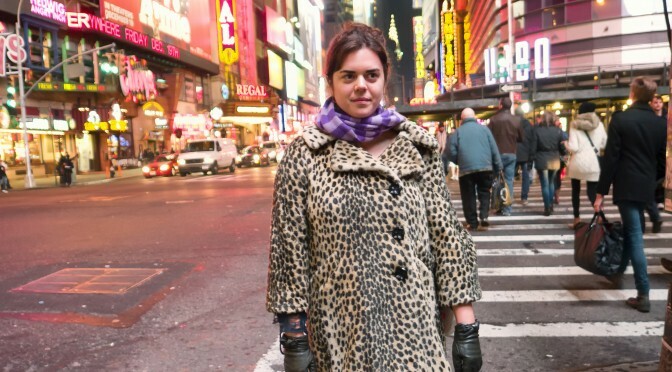 Anna Fox is an alliterative amalgamation of performer/poet/playwright and aspiring astrologer. She currently lives in Los Angeles, CA, but is also quite nomadic. She has a giant assortment of fake fruit, fake siblings and brightly colored clothing. I have always been eccentric and dramatic. Whether that has anything to do with being an only child or not is questionable, yet I’ve always felt my imaginative inclinations have in part been linked to the fact that growing up, I did not have a sibling around to entertain me. I would spend hours playing elaborate games in which I would voice all the characters. The strangest of which was “my cousin Al Gore”, in which I would converse with the then Vice President about climate change, politics and what headband I should wear to school on Monday, all while sharing a cheese pizza. I also played board games alone, where I invented various strategies and personality traits for each individual player and then steeped myself in each one when it was his/her turn. When I was older and learned the definition of schizophrenia, I was certain I had it due to the amount of time I spent communicating with the voices in my head. It was only natural that I then took an interest in theater. I would have been innately creative no matter what, but being an only child forced me to be inventive in ways children with siblings sometimes do not have to resort to. I also had to be comfortable being independent and self-reliant at a young age, and while that has proven immensely helpful in navigating the world at large, I have always felt a bit lonely. Even though I have many friends and enjoy spending time with others, I can’t help but observe the sacred ties my friends have with their brothers or sisters and feel like I am missing out. I am not generally one to complain about something another person has and I don’t. I see those as opportunities to work towards achieving the same thing, but I can’t ever achieve having a sibling. Some cousins inevitably adopted me as their surrogate sister, mostly within the context of feuding with their actual sister, but I was never the real deal. The same felt true of my step sisters because not only did I not spend a significant portion of time with them, their already in place family dynamic felt foreign to me. What being the illegitimate sister did teach me was fantastic mediation skills. I was always somehow caught in the middle of other people’s sibling rivalry and used as the third party to determine how to solve the feud. I enjoyed this role and sometimes did not actually envy having a real sister. I liked being able to choose the fun and convenient aspects of having a sibling, without all the real hassle. I look forward to having my own children and putting these skills to good use once more. I first started writing about siblingless children when a fellow only child friend and I wrote a play about two fictionalized only children living in the town we grew up in. We then decided the play would be much better as a TV show, although we haven’t gotten around to making it quite yet. While I primarily write plays, I decided it was also time to venture more seriously into other forms of writing. I have always admired the Civilians’ method of working, and have also always been fascinated with surveys and collecting data. While this book is in no way meant to be theatrical, I thought it wise to embark on a mission to interview as many only children as possible from various age ranges, geographical locations and walks of life to gather data on the similarities and differences between all of us. It then only seemed natural to get my good friend Fredda Gordon involved to photograph these individuals, and thus the idea for the book Only Children was born. I am primarily interested in seeing how only children do and do not fit into the stereotypes surrounding them, if they are artistically inclined, and why they are only children. I find that personally I do not fit a lot of the stereotypes because my dad was not around for much of my upbringing, thus having a single mom who needed to work and support us made me somewhat less spoiled than the stereotypically imagined only child. I’ve also always loved to share with others, so I felt that there was something to exploring these myths surrounding only children. Like I mentioned above, I do think there is something to only children taking on artistic paths in life. If you have to entertain yourself for hours, you will find creative ways, and these ways might become a big part of your life. Yet, most interestingly and sometimes unbeknownst to the child. Why did someone’s parents choose not to have other kids? Were they very young? Very old? Financially unstable? Unable to choose simply because they couldn’t get pregnant again? Or, in the case of my parents, ill-suited for one another and got divorced early on. I am starting to see that most people who have children envision a life with more than one, but life doesn’t always work out the way we plan it to, and thus many of us onlies roam the earth, befriending those decades older than us with very little effort and wondering what it would have been like to had to have shared a room with anyone other than our beloved childhood pet. This book is for anyone who likes to learn about other people. My hope is that only children can compare their experiences to those of the individuals in this book, and for people with siblings to learn about an experience unlike their own, while also finding ways in which they relate. We are all only humans after all.